Filmmaker and actor #SamirSoni whose wife #NeelamKothari has been acquitted from #blackbug poaching case has said that there has been injustice done with #SalmanKhan. Samir Soni was interacting with media at Mumbai domestic airport when he was returning from Jodhpur after his wife Neelam Kothari acquitted from ‘Black Poaching Case’ along with Saif Ali Khan, Sonali Bendre and Tabu on Thursday in Mumbai. 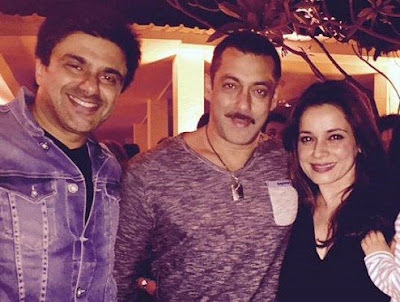 When asked Samir whether this judgment came as a relief to Neelam Kothari and her family, he said, “Obviously, for almost 20 years, there was sword which hanged on us and there used to be a fear that anytime a phone call can come for the arrest but I feeling bad for Salman"
After the court verdict came out yesterday, Salman Khan spend his entire day at Jodhpur central jail and now, according to recent reports, Salman Khan to spend another day in jail as Jodhpur court reserves bail order till tomorrow.